Articles of the Shadow Proclomation is running a meme based on my favorite TV show of all-time, Doctor Who. Today's question is what is your favorite story from the classic series? (You can't really say episode since most Who is multi-part stories). 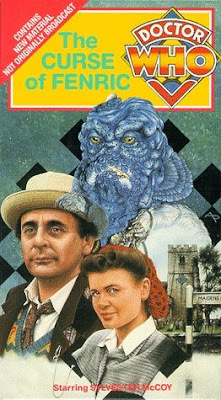 And my answer is the seventh Doctor classic "The Curse of Fenric." It's been my favorite since I first saw it years ago on my local PBS station and it's continued to top my list ever since. It's among my top five of all shows ever. I even love it in spite of all the various versions that are out there. We have the original TV edit, the VHS extended edition and then the special edition movie version on the second disc of the DVD release. I've got all three (the TV edit and the special edition movie are on the DVD release), though I will say that I prefer the episodic extended edition on VHS. It helps make a jumpy episode one flow a lot more smoothly. (I'd almost say a three-disc "definitive" edition with all the versions on it should be released since the BBC is now starting to double-dip on the range). And that doesn't even include the Target novel, which is among one of the best the range ever offered. (I've still got it along with my full run of all the seventh Doctor Target books since they were harder to find as the range ran its course). If there was a novel screaming for an audio release, it's this one. It's not a great story to bring people into the Doctor Who fold, but it's still my favorite. I realize that it's a transition year and that the Vols have a lot of issues at depth. But watching them play a solid first half against Alabama last night only to be disappointed when Bama adjusted in the second half and we were left in the dust was frustrating. Like Coach Dooley, I'm not sure there should be any more moral victories and that it's time to turn a corner and win one of these things. It could have been last night, but alas it wasn't. I will admit I was also frustrated with the ESPN broadcast crew of Brad Nessler and Todd Blacklidge. Long time readers will know I have no love for Blackledge, but usually can stomach Nessler. But last night as the game wore on, I got tired of the condescending talking down "Oh they'll be better soon" discussion that the two kept engaging in. I'm not three and don't need a pat on the head and to be told it will be OK. The way they acted, we should just be happy that Tennessee is on their great network and take what we can get. No matter what else I can say about Verne "I called plays when Moses ran the spread" Lundquist, at least he doesn't talk down to his audience. Of course, if the Vols had been able to stay with it in the second half, maybe they wouldn't have felt the need for such speeches. I'm still behind the team and think that if South Carolina's big running back is out that we stand a chance next week. I'd feel better about the odds if the game were in Knoxville, but hey, this is the time of the year that South Carolina starts finding ways to lose rather than win. So Bleachers has published their list of the 50 greatest traditions in college sports and the Vols have three entries on the list. Smokey is 49, the Vol Navy is 43 and Rocky Top is number 16. And while it's great to see all those in there, they failed to include the GREATEST moment in all of sports PERIOD. The Vols running through the T before each home game. Forget your silly tradition of "Script Ohio" at Ohio State. I defy any school in any other conference to have a moment that is such pure joy, anticipation, excitement and pure unbridled fandom than when the Vols come out through the T.
No other moment in college sports (or pro for that matter) even comes close. Can't really add much to what I said last year. Can You Spare A Couple of Bucks? I must have an approachable look when I'm out on the streets of Nashville. Walking between my car and office today, I was approached by two different people seeking funds because they were hungry. I both cases, I responded with my usual reply--I won't give you money, but will buy you something to eat or point you in the direction of the mission a few blocks up. In both cases, neither party wanted this help. In fact, one guy looked at me and got pretty upset that I'd even suggested the mission to him. "S***! I wouldn't send my dog there," he told me, before walking off in a huff. Interestingly, neither case was interested in my buying them something to eat, making me think they weren't necessarily interested in eating a meal. What's the best way to get revenge on your ex-girlfriend? Apparently one of them is calling her out on CSPAN during some kind of discussion of books and liberal vs conservative value. You'll have to fast forward just after three minutes and thirty seconds to see the calling out and the growing level of discomfort at the guy overshares a bit too much and proves that he's probably not over Helen. And thank heavens for the Internet. It allows someone else to watch hours of CSPAN and offer up these random bits for us rather than making us all have to sit through it. Training for a long run is a lot easier than the post-run. I say this because you can easily find all kinds of schedules and suggestions of how much you can and should do leading up to race, but there's no set schedule of things once you're done. I waited two days before I hit the road again to run after the Middle Half. I took Sunday off entirely from doing any kind of workout and I hit the pool Monday afternoon for my usual longer swim routine. So it was that I hit the road against yesterday for what I figured would be a slower recovery run. I warmed up in the pool (still my first choice of exercise and my favorite way to get the blood flowing. The only thing that would make the Middle Half better for me is if I could somehow swim to warm-up before I started the long run. It sounds like a lot, but even doing a half mile swim for me would be helpful. I just feel so much better, looser and ready to go for a run after a warm-up swim) and then hit the road. At first, my legs and hips were determined to remind me, "Hey, you know we did run 13.1 miles the other day" while my stomach said, "Hey you promised us a doughnut and we have yet to see one here." At first, my legs were a bit spongy and sore, but things improved quickly and while I didn't feel like running 13.1 again, I still felt pretty good. The day had turned dramatically cooler from the time I assembled my running stuff (it's really time to start breaking in my new running shoes, but I ran one more time on my older ones) and the cool breeze helped things. (as in, it's time to run faster so I can get back inside where it's warm). Flipping around last week, I discovered a new cable station in my myriad of channels called the Hub. Among the offerings on the channel is one of my favorite shows of all time, "Happy Days." I flipped over and found the show in its first season. And while these episodes are interesting (watching it develop into the hit it eventually becomes is fascinating and something that would never happen today because most networks wouldn't have the patience for it or the intestinal fortitude to change things like they did between seasons two and three), they're not among my favorites. Which is why I was saddened to hear the news tonight that actor Tom Bosley has passed away. Bosley was the patriarch of the Cunningham clan and while Fonzie and Richie were the stars of the show, Bosley was one of many actors who helped hold things together and kept things grounded...well, as much as can be expected. In one of those ice breaking games once, I was asked if I could be part of a TV family which would it be. Without hesitating, I said it'd be the Cunninghams. No matter how crazy things got, you always felt like Howard and Marion loved each other and were still excited to be married to each other after all those years. They allowed their kids to be themselves but still offered solid parenting to them. I know it's just a TV show, but it still worked for me on many levels. And while we all sort of figured that Mrs. C had a crush on the Fonz, we always knew that her heart belonged to Howard. What a great show. And it's a shame to lose one of the cast. Thanks for the memories and the great work, Mr. Bosley. May you rest in peace. The Titan's made their lone appearance on Monday Night Football this season last night as they clobbered division rival the Jacksonville Jaguars 30-3. Watching the game, I was a lot happier than one of the last times the team was showcased on Monday Night Football when then-host Tony Kornheiser couldn't insult and demean Nashville and Tennessee fast enough. And while the commentators for the game (still not my favorite broadcast group, but still a damn sight better than Gus "Every play makes me shout" Johnson) were fair in their assessment of praise and criticisms of the Titans, I still found the bias that ESPN has against the Titans to rear its ugly head during the post-game coverage, specifically on SportsCenter. I understand that baseball is in its post-season and will be for the next six to eight weeks. And that there was a game involving Cliff Lee single-handedly playing all nine positions on the field against the New York Yankees last night. But come on, ESPN! Pushing the highlights of the game down until close to twenty minutes from the top of the hour is just absurd. It's made worse by the fact that we get five minutes of dithering on the leading with your helmet controversy that has reared its ugly head in the past 24 hours. (Don't get me wrong, it's important but surely there must be other sports stories going on somewhere. You know it's bad when I find myself almost wishing for a pre-season NBA highlight or soccer highlights). And then the bias showed itself again in the commentary made by Steve Young about the game. He called it an ugly one at one point, saying that a highlight being shown was only because the game was "so bad." You can bet your sweet bippie if it had been highlights say of the Cowboys doing something or the Vikings, they couldn't have praised it fast enough. Speaking of the Cowboys, as anyone else sick and tired of hearing about this year's edition? I pull against them at every chance I get and I despite them just on principle, but many the absurd amounts of coverage for this team are making me hate them that much more. I get that they're underachieving, but I also get annoyed that every team that beats them only does it because the Cowboys let them. I've heard that for the Titans and Redskins this year...it wasn't so much that we won so much as the Cowboys lost. I'll admit the Redskins weren't spectacular on opening night against the Cowboys, but we still did enough to get more points that they did. And last week, the Titans came out and punched the Cowboys in the mouth and then beat them my taking advantage of their mistakes. We turned them into points and came up with big plays at critical times. As I said before, I hate the Cowboys anyway. Always have. I will admit that watching that team play this year, I'm struck by how self-aggrandizing the team is. Every first down is cause for a major celebration. Few teams in the NFL celebrate every minor play as much as the Cowboys. I keep muttering, "Act like you've been there" as I see the game or highlights on ESPN or the NFL Network. I understand that football is an emotional sport and there are times when it's appropriate to be excited and to pump your chest. But not when you convert a third and short for a first down. I think the problem in Dallas is similar to the one the Redskins have faced in the past couple of years--you can't assemble a fantasy football team in real life and expect it to win. You've got to have a team and not just a collection of players. Anyway, back to my original point. You know, I can understand the NFL throwing the city of Jacksonville a bone by giving them a Monday night showcase. But you'd think the city and fans would respond by at least filling most of the stadium for kick-off. I saw so many empty, lower-bowl seats in the stadium last night that it was laughable. Given that the team beat Indy a few weeks ago and then won against the Bills last week and is taking on a huge division rival, you'd think some fans would show up for the game. Apparently not. Last year, it was all about crossing the finish line, making it 13.1 miles without collapsing, cramping up or worse. Leading up to the Middle Half, my big concern was a stress fracture in a toe during late June and July that had thrown my training schedule off and left me concerned that while I had the endurance to run 13.1 miles, I wasn't sure I had the stamina. I finished last year in a time of two and a half hours. I was proud of the accomplishment. This year, it was about improving, getting better, getting stronger, getting a bit faster. I knew I wasn't going to make some huge quantum leap forward, shaving off half an hour. But I wanted to be a bit faster. I wanted to be a bit less sore when the race was done. I wanted to show myself it wasn't a one-time thing. And I wanted to be able to eat a doughnut or two after the race and not worry about it. (Because let's face it, we all have our own motivators....mine is a good Krispy Kreme or two every once in a while). So, Saturday I lined up again and ran the Middle Half again. I was a lot more prepared this year mentally for it. Having done it last year, I knew I could do it this year. There were fewer surprise and I felt like I knew the course a bit better. I knew where my potential pitfalls were and it was easier to plan out things like where the water stations were and how to arrange my mix on my iPod for during the race. I also had a better idea of where to place myself in the starting group. And so, it kicked off Saturday morning....early. And I did it. My time declined a bit and while I didn't quite meet the overall goal I wanted, I was still eight minutes or so faster than last year (overall time: 2:21.36). I was less sore after the race (a combination of training, ibuprofen and a heating pad) and I felt good after I was done. It started off well as I wore my new UT long-sleeved running shirt (found it Friday at Target and was excited about it) and kicked off my run with one of the greatest songs in the entire universe, "Rocky Top." If those two couldn't motivate me and get me off to a good start, nothing would! It was still a challenge and one I'm glad I did. I've made some improvements in my physical health but I've still got some things to work on (most of them related to the inability at times to resist the aforementioned Kristy Kremes). And I'll probably be back for it next year. I've got some new ideas and goals for myself and the good thing is I've got a group of friends around me who will help me improve. So, for the next day or so, it's a lighter routine and then it's back to it. As an example of where the Vols have put my mental psyche this season, I relate to you a couple of dreams I had last night. It started with my trying to obtain tickets to the game in question in which the Vols would go up against the top ranked team in the nation on their home turf. At first, I thought said tickets were going for face value or were free only to find that the price had tripled because I hadn't returned the call fast enough. So, I guess I'll never know how my subconscious thinks things should play out. The new fall season is upon us and I've been tuning in to some old favorites and trying out some of the new stuff. A few comments on some of what I've seen. This show desperately wants to fill the void for serialized, mystery-driven drama left by "Lost." But the one thing "Lost" had in its favor was that it had interesting characters and while I had my favorites, I was still curious enough to tune in each week to find out more about them. So far, I've not felt any connection to any of the characters on this show. As for the mystery-element, it seems to have borrowed a lot of elements from a lot of other shows--there's a conspiracy story along the lines of "X-Files," there's weird stuff happening along the lines of "Fringe" and there's the everyman caught up in events beyond his control similar to "24." And, so far, it has yet to really engage me in any significant way. I'm not sure telling us that the main hero's fiancee is still alive is the best way to go since it removes that level of mystery. The first installment ended on a fascinating cliffhanger that really compelled me to want to see episode two. But nothing in episode two left me eager for the third installment. I will still probably tune in and give it another chance or two, but I'm still a bit frustrated by it. I think part of it is that we still have no idea what this "event" is just yet. So far, it's been lots of talking about things in vague pronouns. Even by three episodes in, at least "Heroes" had some idea of where things were headed....oh sure, it fell apart by the end of season one. As a big fan of Michael Chicklis from "The Shield," I was looking forward to this one. I knew it wouldn't be a gritty drama along the lines of that show, but I still found the first episode a lot of fun. The show remembered that people having powers is fun. Watching each family member discover what he or she can do worked well and there's enough of a sense of a bigger picture unfolding that I'll give this one a long-term shot. So, I watched the first episode and was intrigued. And then it tanked in the ratings and I've got episode two on the DVR and wondering--should I bother? It will never be completed and it's likely we'll never see any more episodes. Should I just let the pilot sit as a noble experiment and an hour I enjoyed or should I watch the second installment? I can't quite decide. Possibly my favorite new show of the fall. If you haven't seen it, the first three episodes are On Demand from Comcast and worth the time. It's not doing as well as some other FX shows, so please watch. I want more of this one. For the past several hours, I've been pondering an age-old question. Which is worse: getting your posterior handed to you for an entire game and losing my double digits or a kick in the teeth loss like the Vols experienced today at LSU. Or in the case of this game--to have a win ripped out from under you in the last second. Of course, there were a lot of small and large mistakes that lead up to it. Even before we had 13 guys on the field on defense, there were a couple of plays that defined things. The first is the phantom pass interference call made by the refs late in the drive, giving LSU the ball at the two. That ball was not catchable. Then, if we back up a bit more, we have the failure to convert on fourth and one late in the game, close to the red zone. I'm not a coach, but I fail to understand why you don't do a QB sneak and go behind the offensive line rather than falling back to hand off two yards deep. Or maybe we punt and pin them back...make them work harder to drive down field. Injuries to our kicker hurt us. As I said last year after Alabama, we've got a whole soccer team over there at UT...surely one of those guys could kick a field goal or two for us! Yes, I'm angry, bitter, hurt and have had my heart stomped out. To go from the thrill of a huge upset to the agony of defeat in about two minutes....I can't put into words the pain, shock, awe I felt. Les Miles needs to get down on his knees and thank the Vols for allowing him to keep his job for another week. I don't follow LSU closely, but it seems like every time I see them play I see some phenomenal foul-up when it comes to managing the clock late in the game. It's bit them before and it nearly bit them today. And LSU is the worst top ten I've seen in a long time. They've got some huge issues and I think the Vols exposed a lot of them today. I predict at least three losses headed their way before season's end--Florida, Alabama, Auburn. I wouldn't be proud of that win, LSU fans. It was stolen, plain and simple. On a more positive note, I feel like we saw the Vols mature on offense in the fourth quarter. I saw a confidence build and even though we didn't make the fourth-and-one when we so desperately needed it, I still felt like we made some good strides. I hope the Vol are as mad as I am. And that we take it out next week on Georgia. I'd love to see the Vols head down there and whip the stuffing out of the Bulldogs!